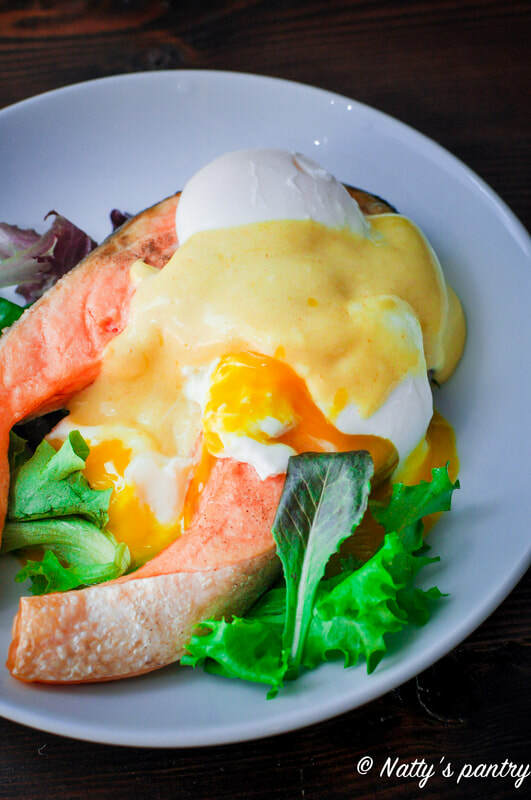 Eggs benedict has become one of my favorite breakfast or brunch meals, and this Oven-Baked Salmon Eggs Benedict just takes it up a notch for sure. I feel like this whole30 program makes it easy for me to make an excuse to have eggs benedict for breakfast every day. For my weekly meal plan, I always choose the recipe that I can turn leftovers into Eggs Benedict dish. It is easier to make ahead for a week of Whole30 hollandaise sauce, and balsamic vinaigrette. So then every time I can turn leftovers into this delicious breakfast and brunch. Place Salmon, skin side down on the baking sheet with tin foil. Season salmon with salt and pepper, bake for about 12 to 15 minutes until salmon is cooked through. 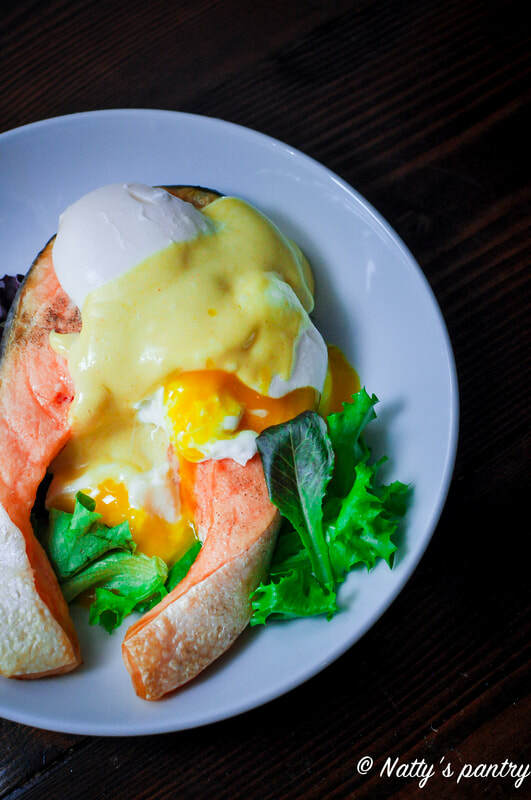 Meanwhile while making the poached egg and Whole30 hollandaise sauce, remove salmon from the oven. Set aside. Toss the greens, tomatoes, red onion, pistachio, almond slice, and Whole30 balsamic vinaigrette in a large bowl. Add salt to taste. Divide among 2 salad bowls. 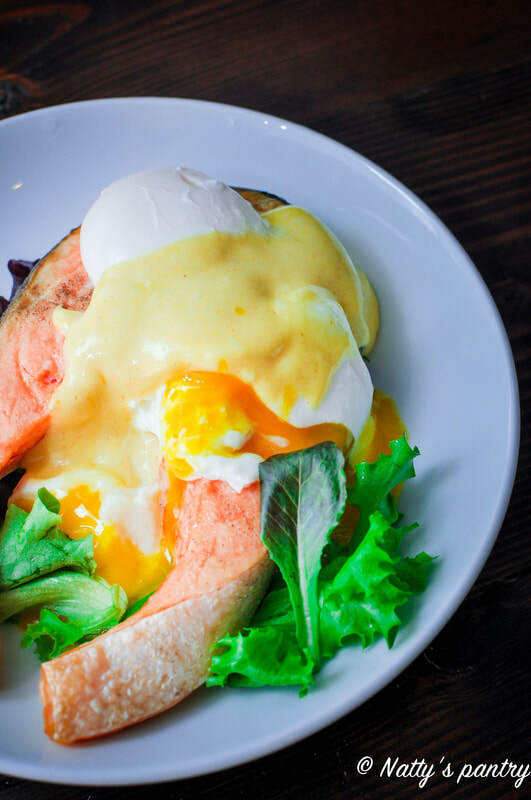 Adding baked salmon steak, poached egg, and drizzle Hollandaise sauce on top. You can add a Seasoned salt and pepper for a taste.